Is Migrating to Magento Enterprise Worth It? You might be wondering if the switch from Magento Community to Magento Enterprise is worth it. While it does require making a small investment, your return on investment will be immense, making your decision worth it. Today’s competition requires businesses to be competitive, constantly forcing them to find ways to stand apart from everyone else. Taking the leap from the free community-based Magento platform to the fee-based Magento Enterprise will help you make those changes that help you stand out from your competitors. There are several reasons why the investment in switching from Magento Community to Magento Enterprise makes sense. The biggest reason, however, is the customization Magento Enterprise allows. This will help your eCommerce store be much different than any other store in your industry. If you have a large catalog that has special requirements or you wish to accept gift card payments or even offer private sales, it can all be done with Magento Enterprise. There is also a major difference in the support you will receive. Magento Community is supported by the community members. Magento Enterprise, on the other hand, has full-time support from the Magento team. Magento is consistently researching and updating the platform to offer the most successful platform to eCommerce owners. This is not to say Magento Community is not worth using. For some retail stores, it is perfectly acceptable. For those eCommerce stores that have moved beyond the capabilities of Magento Community, it might be time for Magento Enterprise. With two completely different audiences, retail stores simply need to figure out where they fit in. 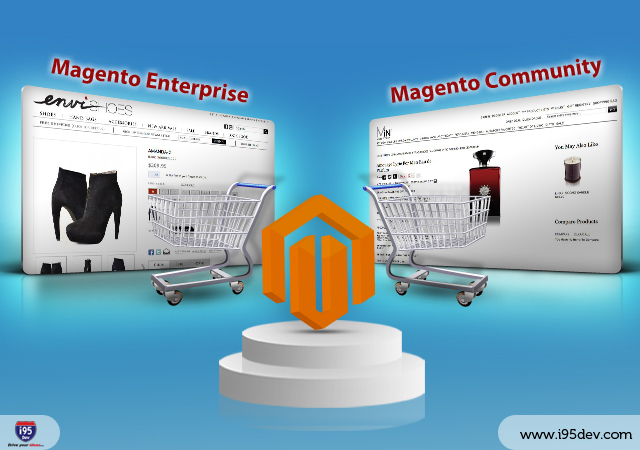 Magento Enterprise offers everything that even the most complex eCommerce store would need. With legal protection for many factors, including protecting intellectual property, Magento Enterprise is sophisticated in its functions. A few of the unique perks of Magento Enterprise include the ability to offer private sales, hold multiple licenses and offer advanced store credit options, including gift card payments. On the administration end, Magento Enterprise offers consulting services and support, the ability to track all admin actions to find any problems and enhanced security, including items like automatic password expirations. The vast number of functions and capabilities of Magento Enterprise makes it easy to recommend any business that is ready to move to the next level migrate to Magento Enterprise. Our team at i95Dev staffs experienced and knowledgeable Magento Developers who can handle the migration for you, allowing you to focus on the sales and operations of your business.